Unless they are properly taken care of, cleaned regularly and maintained throughout the year, Cooling towers can become an ideal host ground for the growth and multiplication of millions of different types of organisms including bacteria such as Legionella. Even when Cooling Towers are in a period of non-use such as during the winter, essential maintenance and cleaning is vital to make sure existing issues with bacterial growth and other factors such as general disrepair are not made any worse. Using a regular program of biocides can drastically reduce problems with bacteria, but proper maintenance, including a twice yearly cleaning is generally advised for best practice and safety. In terms of professional documentation and guidance, the United States Occupational Safety and Health Administration’s Technical Manual agrees with this, recommending that all cooling towers should be subject to a thorough cleaning at least twice a year. Penn Jersey take a thorough approach to professional cooling tower cleaning. It isn’t simply about removing bacteria and corrosion, but the future health of the tower and helping to prevent further build-up of organisms. 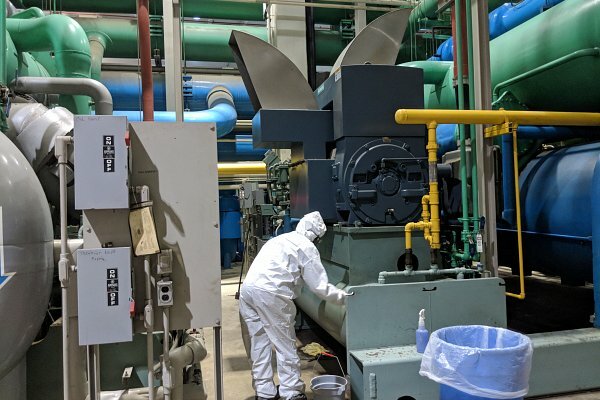 Thorough disinfection and cleaning of the site is essential to make sure this does not happen and your cooling tower and associated systems stay fully operational. Chemical treatment of the fan housing in cooling towers is an important step to take, but this alone cannot ensure the prevention of bacteria taking hold again. Therefore, it is important that the fan housing should be cleaned thoroughly and disinfected carefully before it is treated with chemical agents. The main reason is that vapor in the air will cause condensation to form. From this, biological organisms can grow and multiply much more easily. This can create problems with cleaning further down the line. If left too long, traditional cleaning services are then less likely to work. Full and proper cleaning will ensure that there is less risk from airborne bacteria and pathogens. If cleaned properly, a cooling tower is then at a lower risk of becoming corroded. Cooling Tower basins also need regular and thorough cleaning to keep them in check. These are areas which come into contact with large amounts of cooling water. Within this water, bacteria can quickly form. The water in cooling tower basins also tends to be richer in oxygen and this also increases the risk of organism multiplication. Regular cleaning and disinfecting followed by the correct addition of chemicals either at the start or end of the cooling season will ensure the endurance and consistent running of the cooling tower. The distribution pan and associated areas can often become impacted and clogged if not taken care of properly. The debris that collects in them is often removed with normal filtration, but this is not one hundred percent fool proof. Distribution pans should always be cleaned thoroughly and opened up to improve water flow. A general reduction in water flow can often be associated with clogged pans and distributors. This in turn can result in the tower’s ability to cool water being drastically reduced. If distribution pans are left unchecked, general increases in energy usage can occur. Contact Penn Jersey for a Cooling Tower Cleaning consultation, for more information on the types of service we can provide you with and our costings. Often, pricing will be based on the size of the tower and the location so call or email us today.